April 8th-18th, 2019 Registrations Are Now Open! Please click the Register button below to secure your spot at our April Camps. A Parent Information booklet for the 2019 camps is available here. To kick off our April 2019 camp, we've got a fun day instore with Aussie Aths and Dodgeball. Plus, we welcome a new feature to our program with Table Tennis. Today, we welcome back codingEdge Technology with their Robotics classes Dance Fitness Victoria and Tennis rounds out a very exciting day! Aussie Aths return for more, Taekwondo makes its first appearance to the action and we welcome back Fabe's Drama Classes as part of the day. Today, we welcome back A-League and W-League favourite Melbourne City FC to the program. perfect for those who love soccer, it'll be a day based around skill development and fun, led by coaching staff from the club. Participants will receive a Merchandise or Junior Membership pack as part of the day. An exciting day awaits, with an Obstacle Course designed to keep kids running and jumping! Dodgeball and Tee Ball will complete the day. The all-time favourite of Fencing returns for April and is joined by AFL and Taekwondo for a day that is sure to keep all involved up and moving. In collaboration with codingEdge Technology, join in on a fun session of Robotics. Plus, we'll go outdoors for Touch Rugby and continue to learn the skills to become a Table Tennis master. Returning to the camps, we welcome back A-league and W-league favourite Melbourne City FC to the program. Perfect for those who love soccer, it'll be a day based around skill development and fun, led by coaching staff from the club. Participants will receive a Merchandise or Junior Membership pack as part of the day! Today, a fun day of Taekwondo and Dance is in store with an exciting Dodgeball session at the end of the day. To break up the week, Fencing returns alongside Aussie Aths and Fabes Drama class completes the day of fun. For the multi-sport program today, an engaging and exciting day awaits, with Tennis, Dance and Aussie Aths getting all involved. Programs will not run on this day due to the observed university Good Friday public holiday. You'll receive a confirmation email once the registration is complete. We look forward to seeing you at our Camps! MU Sport welcome all children aged 5-12 to join us for our Sports Camps over the school holidays. Featuring multi-sport and sport-specific days, group games and more, children will learn the values of teamwork, whilst improving their game sense, movement and coordination skills. All of this takes place in a fun, friendly and safe environment. Sports Camps are conveniently located just north of Melbourne's CBD at The University of Melbourne's Parkville Campus in our Sports Precinct on Tin Alley, In addition, the camps have the advantage of using the University's facilities where some of Victoria’s premier sports teams train and play. Children will engage in a number of popular sports such as athletics, soccer, AFL and more. MU Sport staff have great experience in teaching primary aged children, childcare and coaching a variety of sports. All staff have Working With Children Checks and relevant First Aid qualifications. Many are also specialists in a specific sport and bring a wealth of experience to our camps - check out the highlights above to see some exciting features of our upcoming Camp. Offering drop off from 8am, children have plenty of time to get to know their coaches before jumping into their first fun session. With breaks for morning tea and lunch, the day's activities will wrap up around 3:30pm. Children may be collected at this point or, if a later time is better, they may join us for After Camp Care - please see below for more information. 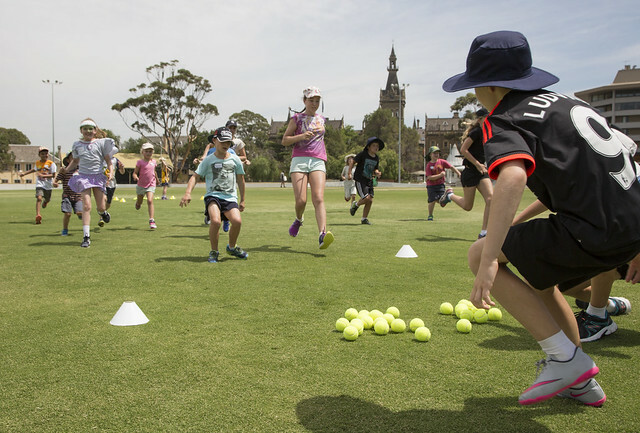 If you would like more information, please read our FAQs, view the parking map, email sport-camps@unimelb.edu.au or contact the Coordinator on 8344 2090. Check out the Sports Camps flyer here. Once the day's sporting activities are over, children are welcome to stay on for After Camp Care in our function spaces. Complete with engaging board games, a movie and quiet spaces to read, relax and more, this is ideal for parents who need flexible hours to pick up their children. Aftercamp care costs just $10. Children are more than welcome to bring a book. Don't forget to pack an afternoon snack! After Camp Care runs until 5:30pm. codingEdge Technology run coding, electronics and robotics workshops alongside our Sports Camps. Note that the coding workshops have separate activities, staffing and registration forms. The workshops are suitable for children with little to no coding experience through to experienced coders. See flyer in registration link for workshop details.